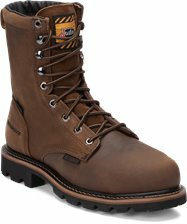 The 11-inch tall Driscoll Mahogany Waterproof Steel Toe MetGuard pull-on workboot is built for maximum performance. 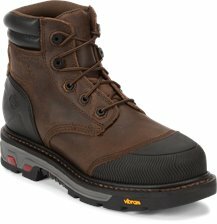 It's dark mahogany exterior is accented by a simple stitch pattern on the upper and features an Ortholite® insole for lasting comfort and a steel shank for added support; The steel toe and waterproof leather help keep you safe and dry on the job. It also provides added protection of your metatarsals with a flexible and light weight XRD® Impact Protection Metguard that overlays the safety toe. Its Vibram® Commander-X5™ rubber outsole is resistant to heat, oil, chipping, chemicals, and slipping and provides stability on various terrain. 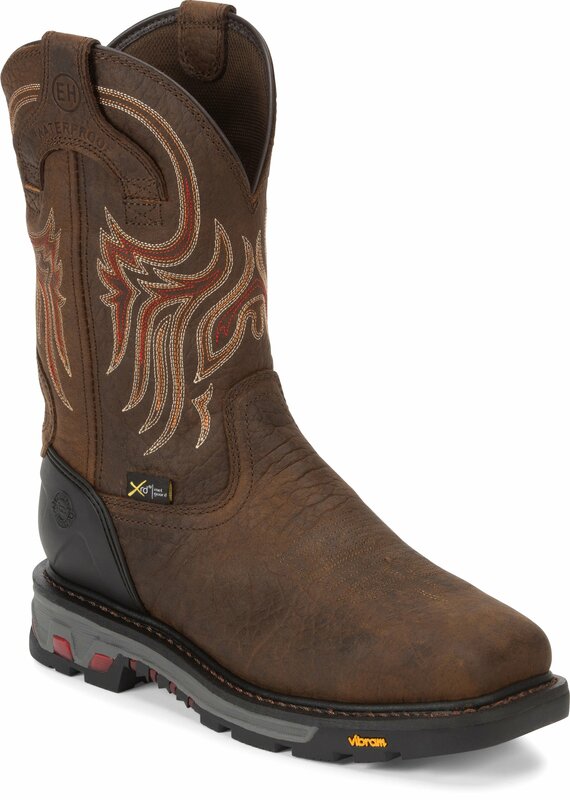 This boot is electrical hazard rated and meets ASTM F2413-11, 175, C75 EH MT safety footwear standards. After only a few months the righ inner liner is loose and makes the boot almost impossible to take off, it pulls up and eventually out with your foot. Based on the other reviews this is definitely a manufacturer defect. Avoid this boot, too bad it was actually comfortable. I bought these boots in January comfortable at first but by the second month they were hard to get off and the inside of the boot started coming apart. I can’t even wear the boots now, very disappointing especially for the price of the boot! 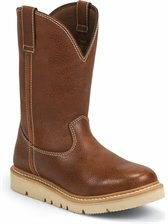 I just bought these boots last week and I will say they are very comfortable, that's one reason I payed so much for them. The other reason was because they are supposed to be waterproof, and they are not. Standing in just enough muddy water to get above the soles and almost instantly I feel water coming in the inside of my right boot. I haven't even scratched the leather yet! I wish I would have read the reviews before I purchased because it sounds like these are a sham. I bought these boots in April and they were awesome, very comfortable, but then I noticed my left boot was starting to lean inward, the cushion layer between the tread and boot was compressing on just inside. This caused my foot to lean inward while standing/ walking making it very uncomfortable. Which made the leaning even more evident. I don't know if it's a defect in my boot or what but it's only my left boot, the right boot is perfectly fine, and I've never had any issues with wearing boots out on left side or anything of that sort.I haven't even worn the tread down on these boots!!! i was impressed at first, but they haven't held up very long, and that's an issue! These boots seem indestructible in an industry where your out soles normally disappear in less than 6 months but they are the heaviest I've worn and you won't enjoy a 12 hour shift if your always on your feet because of the weight. Metatarsal injuries are painful and require a long recovery, and steel toe boots don't protect your metatarsals. MetGuard™ is a thermal plastic urethane shield made with XRD® Impact Protection technology. It overlays the steel box toe and runs to the top of the instep, for armor-like protection of your metatarsals.